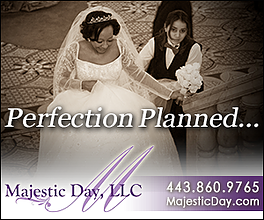 Majestic Day is a full service wedding and special event planning company whose goal is to create, organize and coordinate your special day from start to finish. We are sure that one of our wedding packages will meet your needs. We start by meeting with you to assess your needs, create a realistic budget, refer reputable vendors and implement creative ideas, time saving and money saving tips. Our commitment to excellence ignites our creativity and organizational skills. Every bride can benefit from our professional and personalized service. It is our goal to make every event Majestic! We would be delighted to meet with you to introduce our business services. We invite you to contact our office and schedule an appointment. Our Company works hard to handle the details and to provide optimal service through the “Majestic Approach” which is the first process in the planning stage. We gather the data and special details in order to provide a superior event solution. The “Majestic Approach” addresses challenges, issues, creative ideas, and money-saving tips to produce an event solution with a customized package of products and services.